It’s very nice to have scan capability with your iPhone. This also allows me to send faxes from my computer without going to the office. And it is very user-friendly. I’ve had people download this program to send me documents as opposed to sending out of focus photographs. I love the way it captures the document and allows you to adjust it. Easy enough for anyone to use. Well designed. This app is great. Scan and email documents w/ease. Can incorporate w/other apps as needed, as well. Example: w/ adobe acrobat I can edit document w/free text, send to genius scan and email. (Prefer genius scan over adobe scan, myself) I’ve used this app to send pdf documents to schools, doctors, billing, for flexible spending recoup, to submit paperwork for new jobs and more. Screenshot, download jpeg, take a pic w/camera and convert to pdf and email directly from app. Simple to use. Functions appropriately. Saves documents. Organizes. Love the new updated format. Has saved me time over and over again. It’s the perfect scan app for iPhone. Quality scans really help work flow. I don’t take time to rate stuff. But I absolutely love this scanning app. Reliable. Functional. Intuitive. Easy. Helpful. Actually kind’ve fun too! It enables me to go paperless just by using my iPhone. Syncs seamlessly with gdrive, iCloud, and more! Super happy that I don’t have to own a fax anymore. Super convenient! It simplifies all scanning and copying texts with great flexibility in terms of where to send, storage options and size if document. Why look elsewhere? This is the best. I’ve been using Genius Scan for 3 years. It’s literally one of the most used apps on my phone for my business. I admit, I tried to be cheap and use the free version. After a month, I decided I needed to buy the full version to unlock all the awesome features. Ever since, I use the app to send important documents wherever I am! My husband and I operate two group homes for kids and adults with developmental disabilities. We’re licensed by the state and nonprofit, so the paperwork is unimaginable. This app is crucial to my business and I give it 10 stars! Plus the new update makes it official lol. I love it! TL/DR: Unless you buy Genius Scan+ directly from the App Store, Family Share will not work. Several years ago I downloaded Genius Scan to try it out. Within a few days I realized the $7.99 was worth it and upgraded my free download to the full version. Fast forward to today. My wife has asked me to PDF documents for her several times so I looked into family sharing the app. We’re a member of the same family, and I paid for it, so she should have access. I was extremely disappointed to learn that the upgraded version of Genius Scan does not transfer via Family Share, only the free version. After reading some FAQs I learned that I would have had to download and purchase Genius Scan + directly from the App Store instead of upgrading from the free version. They’re both the same price, so it’s not right that they cannot make the purchase transfer. In a future update, I hope Genius Scan does right by their customers and allows the upgraded app to be shared. I love this app and use it every week. I knew scans of my travel expense receipts for really reliable reporting when I get home. Easy to use. Easy to email. This is an excellent scanner for iPhone!! Great app! Love it and use it always! Used it for years, love it! I’ve used this app for years and it’s helped me streamline the paperwork process for work and school projects. This app is amazing and helps save time during my busy day. I scan, email, and have a back up all at my fingertips. Totally worth it. Excellent app for on-the-go pics that in to be converted into PDFs! Love it! This is truly an awesome app. I turn family members to this. Best app ever makes your scanning of documents and submitting piece of cake. Confused by the new format!! Useless waste in time. Alll for money. I had installed already for an emergency situation that I needed fast. As if free but I even could not send docs. Was not let arrange even send until pay. Be honest please. I installed the other one. It’s ok. Thanks God, I could send. I can keep track, back up and scan docs super easy. Simply Fantastic...makes life so much easier. Literally makes my days so much easier at work! My helpful assistant, Genius Scan! My work environment deals with a lot of scanning, arranging, and combining papers or pictures. This apps makes my life easier than before. I use to pull up my laptop out, turn it on, sign in, and then sign in to get my emails, search for the attachments, and then either arrange or combine. This app design is well put together and super helpful. Thank you. Has changed my life for the better as a teacher...great quality! Why change a good thing??? No need to change ui. It still works but why change a good thing!? I have used the genius scan app in its free version for about a year. I am upgrading to a paid version which I should have done right out the box. But you don’t know till you know. Now you know. I use this app daily, I just tried for 15 minutes to take a pic of document and failed. Why when it was fine ? Great. So nice to have with you on appointments! It’s saved me many times. Wish it had more instructions on how to use. I use this app almost daily for work. I’d be lost without it. Very intuitive and simple to use. Highly recommend. I use this app daily to email PDF files from my phone. Best app I have found out there. 10 star rating!! Love it. Very very handy. It’s super easy to use and scans like a real office scanner. I love the options to edit the scanned items. This app has been easy to use and has been great for graduate school. It has also been helpful for other random things. It’s nice you can do batches of papers at a time or just one. Lifesaving app! Tell all your friends! Absolutely love it! Easily captures pdf's ready to email. Found it by chance, and it completely simplified the way I generate pdf files. I like it berry much so comfortable to work with!!! 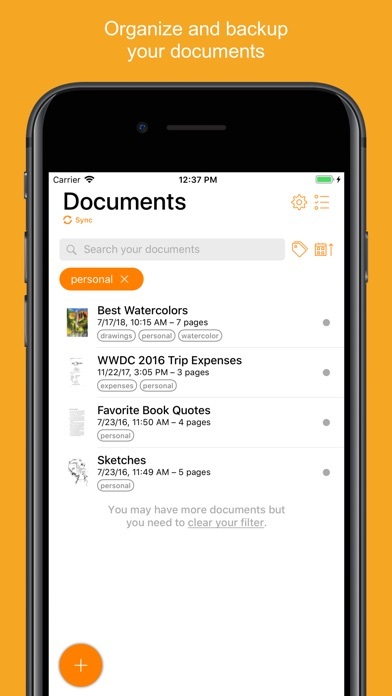 This app is incredibly helpful for scanning documents on the go. I am a graduate student and I have found this app to be extremely helpful at times where I need to scan a document but I don’t have access to a scanner. The scans are of the quality of a basic office scanner. Used this app three years in a row, one day each year. To send my signed IRS e-file authorization back to my accountant. This year the Genius upgrades have become too sophisticated for a simple fax. Today I’m hit with hoops to lunge thru: do I want .pdf files, text indexing, and have found the camera won’t just click the paper , nor offer me a spot to input the phone number to use. Grr ... I’ll have to use some othe app that has remained simple. Time wasted. It saves my time and and works great every time. So easy to use, so easy to export, seamless, the only thing you need to make PDFs with your phone. Love this app. It has saved me many times when I have needed to scan and send something. Love that I can do it from anywhere. No more need to find a scanner and delay getting information out. I work on wild land fires and being able to scan maps and documents from the fire line is awesome. Good information leads to good outcomes. Probably the worst scan app on the market. Can hardly detect a page, and they look like crap when it finally does. This helps so much with documents that need to make it to the office from the field!!! Works as it should. Very easy to use! For my needs this app is a godsend! I mainly need to scan paperwork and put in emails from time to time. This app replaces taking ‘pics’ and texting or emailing them... pics usually use more memory and can’t be edited as easily as a pdf file. I also don’t have to use my printer scanner which is more time consuming. By the time I scan 1 page with printer I can be done with 3 or 4 using this app! I love it!! Things were changed that were not broken. Such as the light theme and the ability to place two images one above the other instead of having to swipe between 2 screens for them. Support services were of no use. Didn’t really try to understand why it was no longer useful to me. Very disappointed after sooooo many users of being a staunch supporter and proponent of Genius Scan and Genius Scan +. As a very busy physician and entrepreneur I use this app EVERY SINGLE DAY!! Thank you Genius Scan for making my life SO much more organized and simple!! I SCAN EVERYTHING!! insurance cards, Bills, receipts, tax docs, notices, insurance info etc and then have it at the tips of my fingers WHENEVER I need it so I’m never at a loss as to “where did I put that card or document? ?” or scrambling for something...it’s always either searchable in my email or Genius Scan! ☺️❤️ I DO NOT get any incentive for writing this or info above, but if you do not have this app then you are missing out BIG TIME!! An intuitive app that is a useful tool. I am very pleased with the performance of this app. The app turns your phone into a high quality scanner. Features allow you to turn on and off your camera flash to get the proper lighting for your scan. You may take batch scans and use edit feature allows you to clean up, crop, resize, or delete scans. When your scan looks the way you want GS converts it to pdf and offers many options for sending the scan. Saves tons of memory from hungry photos. I travel for work and use this to scan receipts, documents and keep myself organized! Love this app! This on the go scan app is absolutely great. Kudos to the designers and the whole team. Beat scanning app there is period! Amazing app, has helped me numerous times. I use it practically everyday. Makes it so easy to send documents with out running to the office. Installed it and as soon. As it opened up very intuitive in what to do next. I tapped the + sign and I was creating my first capture into a document. It asked for access to my camera and I confirmed it and away I went! Fast and easy to deal with. Amazing. I’ve been using this app for 5 years and it’s awesome. I use the app daily for business and it works great, but NOW it has OCR!! Awesome!! Earlier it used to detect A4 pages very quickly but not any more. But it is still a nice app to have. Won’t email. Charges for faxes. I use Genius Scan for work mostly, scanning receipts to a file, among other things. The app is able to make any scan clean and readable. If someone needs a copy of a receipt I simply text or email it. It can be shared on Google Drive, Dropbox, Evernote, or any other number of ways to share it. Most importantly, this app is BETTER at scanning than my Canon flatbed scanner. And faster. This app is $$$. Text recognition worth the wait! I’ve been using Genius Scan for probably close to 10 years. It’s been a reliable app for me all these years and am happy to see it still receives TLC after all these years. I’m finding that for English text recognition actually works astonishingly well and It may be good enough for me to finally throw away my brother scanner that takes 15 minutes per page to upload to dropbox. I’m looking forward to taking care of that Office Space style. I noticed the search doesn’t support partial word search so that is one thing missing from the app with this new functionality unlocked. What is a bit disappointing to me is that it supports Japanese which is similar in many ways, and somewhat more obscure languages like Uyghur, and Sanskrit but not Chinese; one of the most common languages in the world. I hope to see that supported soon. I have been using this app to send files that I scan with my iPhone. I love this so Much. I highly recommend using this. Thanks!!! Very easy to use. Great product! The app was much more user friendly before the update. I have been using Genius Scan for a few years as my primary document scanning App. It just works! Whether it’s a single page simple document or a multi-page complex document. In order to tweak or manipulate the scans or export, send, or store them almost anywhere, it’s easily done with just a few taps. It literally looks the exact same as scanning in paperwork. I cannot even explain how much I’ve used this through college and at my job. I haven’t had to scan anything since 2017 when I got the app. 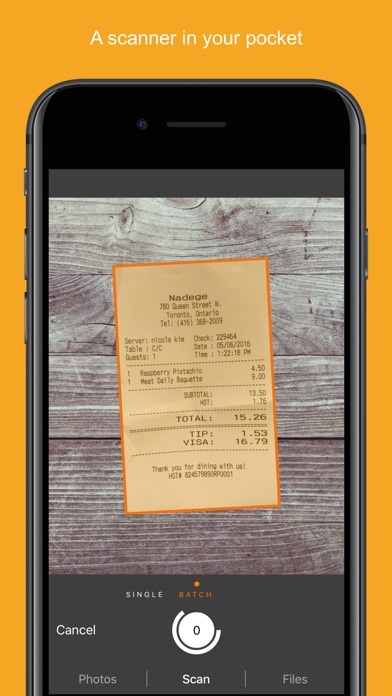 This app is easy to use, no hassle and you can always count on giving you a legible product. This app is the hardest thing to navigate. The images are terrible, if you work out of your car you can’t ever get a good image. Everything is real choppy! If you trying to simply export to Dropbox they try to charge you for it. All the other scanner apps allow you to do that for free! I have been using this app for a few months now. What an awesome app. So easy to use and send documents by email! Fantastic portable easy tool to scan docs!!!! I had used a desktop scanner for years. The scanner cost $400 and was a pain to use. When the company who manufactured it stopped upgrading the software, I found myself in a quandary as ai had upgraded my iMac’s OS and now could I longer use my expensive scanner. So I went to try this $7 app and I am thrilled. Not only does it work well, it saves me time because now I scan my receipts as I go instead of letting them pile up on my desk. And because I’m sending them to a cloud drive, my bookkeeper has access to them faster too. The software provides great options for scanning, hanging up pages, as well as tools to enhance the image. And finally, customer service is fast and courteous. In my opinion you’d have to be an idiot not to use genius scan! I use this app all the time. I travel about 75% of the time. 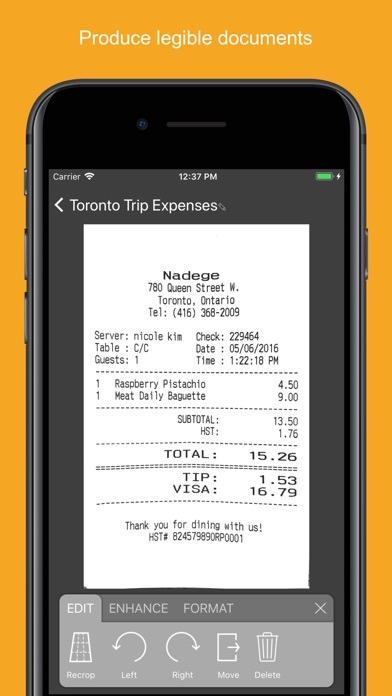 Uploading expense reports is easy and super quick. I would recommend this over other apps. The scans look so much better than a picture. The app lines it up for you. We use the pdf for all work related office use . Works great and simple to use . Keeps life easy , Thanks . Works as you want it to! A good app now ruined! I used to love this app. At this point in time, upon reopening the app after some time away & some updates, my opinion has totally changed. I predict I will NEVER USE this app again. What a shame! I don’t need it often, but when I do it’s a delightful experience that makes me feel like I’m living in the future . I frequently have to scan 1 or 2 pages for work. This scanner has filled the bill! I love it! I'd love to give this app a better rating because I really like the features, if only it would work - it doesn't. I can't open my scans, it states they've been sent to my chosen app - but they aren't there. Where did they GO? I'm very uncomfortable with this! It’s just like having a scanner at your fingertips. I great tool to scan your important documents. The scans are good quality. It’s versatility and accommodations for the everyday user is quite remarkable. Would recommend to anyone! This app came up big every time I needed it! Pretty much every photo scan in real life needs cropping. They made the cropping feature 3 clicks away because the assumption is their automatic image detection is better than it really is. I’d take the old version back in a heartbeat. It it a genius of an app. Works flawlessly. I use it for work and for personal reasons, I can’t say enough about how great it is! This is a great little IOS scanning program. Who ever doesn’t know about this app, is really really missing out! I’ve had about 3 different jobs since the finding of this app and I’ve used it every single time. This way these look are so good!!! That no boys can tell that it was a picture! No more stores, no more paying, boom! Do everything from literally right where you’re at. I love this app and have told man people! Long time user! It is easy to use. I love it, I use, I recommend it. Great app. This is a killer app with great features! I only have the free version so I don’t know if there are differences between this and the paid version. My only complaint is that there would be a major benefit of being able to have sub folders that could be named, for the sake of better organizing of receipts. But maybe there is in the paid version. Otherwise great app! This app is so much easier than scanning with a printer. Super easy to use. Great time saver. Worth every penny for the pro version. My boss at my previous career told me to use this program for keeping track of receipts, invoices and bills of lading. I have used this in to prepare out this sense, for similar application. It’s lightweight, stable and intuitive. Really recommend it. Don’t ever update your apps. First time user. I live it. Can’t *quite* replace our office HP scanner, but almost! When I first learned of Genius Scan I needed to scan something and wasn’t in my office. I haven’t used my office scanner since! It works easily and the scans are always clear and I haven’t had any complaints. It’s made life much easier. I’ve retrieved scans for project information that I needed and it’s saved me more than once. Everything you need is right there in this app. I use this app all the time and it is a life saver. No time to fax; I just use the camera function to snap a photo of my document and it is easily converted into a pdf or jpeg file so I can easily share it. Nice!!! A free app that actually does one basic thing well. Easy to use. Handy when on the go. I’ve used this for years and it works great, especially when on business trips to document receipts. Very easy and handy. Works great! This app is excellent! I especially like the auto-focus and organization when scanning multiple pages. Only wish the free version allowed printing a range group of documents instead of having to export to email then print. I guess you get what you pay for though and in this case a whole lot more - can’t go wrong here! Great for converting scans into pdf files. I use this app on a daily basis for my business. I can use it in the field or in my office to send important documents via email or text. The quality of its scanning is as a good as an electronic scanner.. The app never seems to work! Wheel of death...as it says it’s trying to scan the document. It never seems to work. Use it a lot, easy and functional. Take a picture with your phone, crop and enhance if you need, save it as a PDF, and send. And all this within seconds! I have had it since I was introduced to it by a colleague and U used it A Lot! Love this app and use it all the time! This is by far the BEST scanning app available. It will scan anything in crystal clarity. It was recommended to me by a college drafting instructor. He has his students use it to submit their assignments. The Genius Scan truly lives up to its name, and I recommend it for both professionals and average people like myself. Quick clear scans at the touch of a button! So easy to use. Easy to use, works well and converts easily to pdf. Definitely worth using the free feature and the upgrade for business or personal organization. On occasion, I need to scan a document for work when on the go & this works perfectly. I’ve been using it now for about 2 years. I used to love it. But now there’s a cloud and I can’t see the email I sent. So helpful and easy to use! Never know what you are going to get when you use this app. They seem to make changes that remove functions - and always when you are in a hurry. Currently can only scan single sheets. - not able to scan documents. I use this app a lot for scanning documents and saving into our shared file system. I just wish there was a setting to turn off auto-save document. I don't need a copy of them and I have to then delete them. This app is a fantastic tool especially when you are not near a scanner. It works almost perfectly every time. As an educator, this is worth gold. No problem to scan answer keys for my students. Love it! 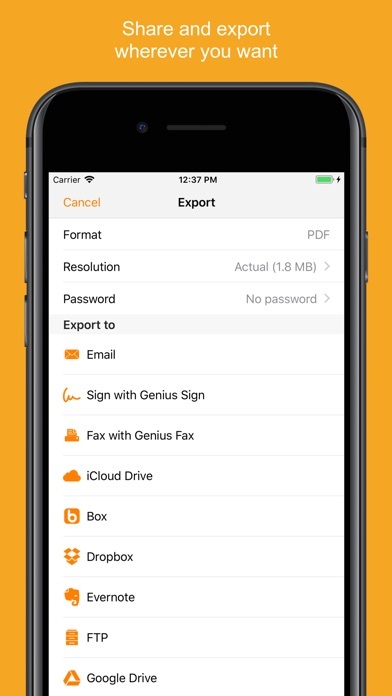 This is a great app to help you turn docs into PDFs and go paperless. Super easy to use. You can’t edit your scanned photos anymore and you alter the real life look of the document. Why did you change this to look like something with technology from the 1970s? I love the new update and the app runs seamlessly. I am using this for work and I need clean scans, I couldn’t access the photocopier and this was a wonderful replacement !! I was told about this app over a year ago and finally needed to use it about 3 months ago. It makes my life so much easier! I can scan all the daily paperwork and receipts in a matter of seconds, rename and email straight from the app to my company. My only gripe thus far is that I wish I had more time on this job to figure out all the ins and outs of the app. I have recommended it numerous times since I started using it and get the same response. I have been using the free app for a year and just upgraded to the + version. It is a very handy and useful way to substitute a fax. Many of my friends have adopted the App as well. Works very well. Only issue is it has issues with shadows in photos. This is a lifesaver for on the go scanning and sending PDFs. I’ve been using this free version for 2 yrs now and absolutely love it. I have recommended it to all my coworkers! You can scan any and everything to pdf format. I also use Genius Fax instead of driving around looking for a fax machine. It only cost .99 for 1 page, 6.99 for 10, and 19.99 for 50! Totally worth it. Best scan user friendly app ever! Download right now!! I love this app. I just wish I could print on my printer. I don’t print enough to justify the upgrade. Very easy to use and good quality scan. It works great and is simple to use! Great App, does everything it’s supposed to! It does a pretty good job at enhancing. Use the flash on when the paper is slightly creased or bent, it helps the quality a lot. It is usable very well. Over time of use it does a better job at finding the edges of the subject. This is by far the best. Definitely 5+ stars. This app is great for personal or work use. I appreciate the security of sending a pdf via email. Thank you! I have been using this app for the last seven years. It is one of the easiest scanning app I’ve used to date. This app is what you expect every app to be, nearly flawless. This app is so easy to use and so handy. I love it. Very fast and friendly customer service. 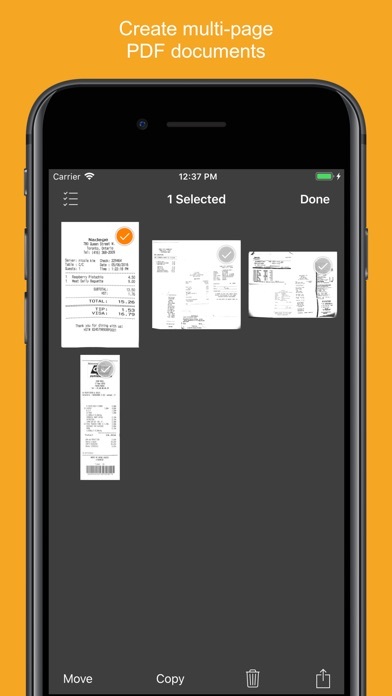 This app works very well with all types of receipts and paperwork. very easy to use and so convenient. The best scanning app. Period. Intuitive, easy to use, and just simply amazing!! The only advice I’d give for scanning photos or colored documents is to make sure you are in a well lit room where the colors “look” as they actually are. After that edit the photos to accentuate the contrast and reduce any over exposed parts of the document, else if you edit and want a color pdf, there is a chance of blowing out some detail. The only advice I’d give the developers is to maybe add in a function to post process the brightness, contrast & saturation after scan, and maybe also add in an ability to fill and sign pdf files. This is a amazingly utilitarian app and almost essential for any kind of activity involving paperwork. Backing up and emailing documents is a snap. It does a pretty good job at enhancing sometimes misses the shade when the paper is slightly creased or bent. It is usable very well. The more you know about it the greater it is! Incredible electronic document tool. Can make almost anything into an incredible single or multiple page PDF. We use it to make users manuals for just developed, out of the box, robotic applications and to add appropriately referenced text book mathematics to software design and development documentation. We are constantly learning of new things we can do with Genius Scan to enhance and optimize our document generation process. Best app ever for storing everything!! Awesome app for business people. Genius Scan is my most valuable app. As a frequent traveler who doesn’t often have access to scanners, this app helps me sign and scan documents on the go that I can send directly via email. The newest update makes multi-page scanning even easier than before! So grateful to the developers for making this app— keep up the great work. Will change your life in a simple yet great way. Never need another scanner!!!!! This is the first time I have used it and so far so good. It is easy and quick. That is just what I need. Simple and straight forward. Will be upgrading to paid version to support this company. Genius Scan is fantastic! I use it for documenting correspondence and financial records as well as keeping track of recipes and articles. It’s an essential tool that helps me stay organized. This is truly an AMAZING app! It is so awesome to be able to have this app when you do not have access to a printer or fax machine. So Thank You for creating such an awesome app available. It is Truly GENIUS!!!!!!!!!! Being using it for years and it is getting better and better! So helpful! I use this all the time when I need to email a document. When I share it with people they are amazed at how easy it is! This is a quick and easy scan app. Can do individual or batches of scans. Can be emailed right from the app. Love it works great!! Quick, easy to use, fantastic quality and always works! Such a great way to get this done ! Future here I come ! Just downloaded this app and I’m so glad I did. It’s a great app! I recommend this app! Great app for my work! It’s easy to crop and edit my worksheets. Simple process to email it to myself. Terrible app and even worse customer service. In some of my classes the professor asks for a pdf scan of assignments, using this you can export directly to Canvas (what my college uses) using the other app button and it makes very clean scans! Highly recommend!! Genius Scan is a must have for anyone who needs a scanner on the go! It’s easy and fast! Love this app,this is really useful. Thank You! Excellent App for work and home. Scans perfectly, has great post-scan tools, exports to just about everything, has great tools for managing and changing PDFs (including creating PDFs, changing page order and inserting pages). Interface is clean and intuitive. I’ve used it to scan books, receipts, legal docs etc. Definitely a 5 star app - highly recommended. One of my my top 5 apps - A must have! I tell everyone I know about this app & tell my clients to download it so they can sign things & get them to me ASAP! It’s one of my top five apps for sure. It helps me run my business smoothly and it has the option to change photos to PDF which is awesome! I can email text or message a document. I can go on anon trust me download this app, use it you won’t be disappointed! Genius Scan is easy & quick. Like that there are no confusing steps to go thru. Only issue I have is the snapshot capture at times it takes long to capture. This could be an issue with my device also. All in all I like it. Genius Scan is fast and worth the $8 paid. However it fails to export tags and location to Evernote. Not sure if those export to other services or not. It’s going on one year since Genius Scan were made aware of the problem and still no fix. Disappointing. Also, when you auto export the app will only export in PDF format and not jpeg. I would rate it a 5 if they would fix these two limitations. There is absolutely nothing better than this tool hands down. Been using this app for years and I love it!!!! I have been using this app for about a year now and I simply love it. A scanner that I can scan documents with and upload to my cloud accounts. I love this app, especially now that I’ve upgraded to the full version. It’s so convenient! My only wish is that I wish I could categorize my files. Thanks for a great app! Great app for school, scanner in the go! Quick and easy!! Loved how wysiwyg it was. 100% recommend it. Seriously, this app has made my life so much better. Administration of my late father’s Trust was a paper nightmare. Flatbed Scanning and sending docs to various agencies and especially my trust attorney was time and labor consuming. Also I’m not the most organized person. Now it’s “point and shoot”, type a title and SEND. (I use PDF mode). Plus it’s on my phone plus it uploads offsite automatically. If you’re ever in a similar situation? I recommend this highly. Our scanner at work was so outdated this app helps to transfer documents back and forth with ease! So thankful! I can’t tell you how many times I’d have been sunk without the ability on my phone to make and send a pdf. I’m an old man, so when I say it’s intuitive enough for a child to use, that’s actually only the second highest bar this app easily clears. I love the apple I use it everyday multiple times. The one big down fall for me is the default mail. I’ve had both IOS which I’m on currently and Android. I wish when you put a default email address in you can choose which email app you use other than just the device email app. I know you can choose other apps but it’s just one more step. That’s my two cents, I do enjoy the app. The best mobile app for Scanning. Period. Very crisp images! I use this app to upload test papers for my parents to view online, instead of sending papers home to get lost. This works great. This is the first time I used it. No problems & fast. First app review ever and only doing it because this is such an amazing app and helps so much day to day. Got referred to it years ago and still use it up to date. Could honestly not say one bad thing about it. Thank you creators! Love this app. Been using it for years! Easy to use. Best scanning app ever. I use this app practically everyday. Wonderful app and updates make it better and better. I use this software for years and it’s simple and does the job. I’ve been using this app for about 3 years now. Super convenient for when I’m on the road and have to send paperwork to my boss. Saved my hash when buying a house, saving important documents, needing to send information without a clunky scanner. I'd pay $20 easily for this app. This app is a must for those who need on the go scanner. Highly recommend . This app is great. I really struck gold when I found this app. Scans come out clear and sharp when emailed. Thank you. So convenient to make a pdf on the fly away, when from my desktop scanner. Quick and easy, very helpful. No watermarks and great features! Definitely the best camera document scanner I've ever used. I don't normally day this about anything, but I like the iOS version of this app more than the Android. Very intuitive and nice looking. I have been using this to scan all types of docs for years and there is nothing bad to say about it. It’s smart enough to detect the borders and crop it neatly. Makes users look like geniuses, even if they’re spelling challenged. Great App, for my law office provides most value for the buck of all apps on my phone.